The Centre for Research Collections and the Alwaleed Bin Talal Centre for the Study of Islam in the Contemporary World are delighted to announce the opening date for the public exhibition The World History of Rashid al-Din, 1314. A Masterpiece of Islamic Painting at the Main Library, University of Edinburgh. The exhibition, opening on 2 August, features folios from the Jami’ al-Tawarikh (or “World History”) of Rashid al-Din: one of the most important illustrated medieval manuscripts to have survived from either East or West. Datable to 1314, it was produced in the city of Tabriz, a seat of power of the Ilkhanid rulers, descendants of the Mongol Chingiz Khan, who held sway over an empire encompassing Persia and large parts of present-day Azerbaijan and Turkey. 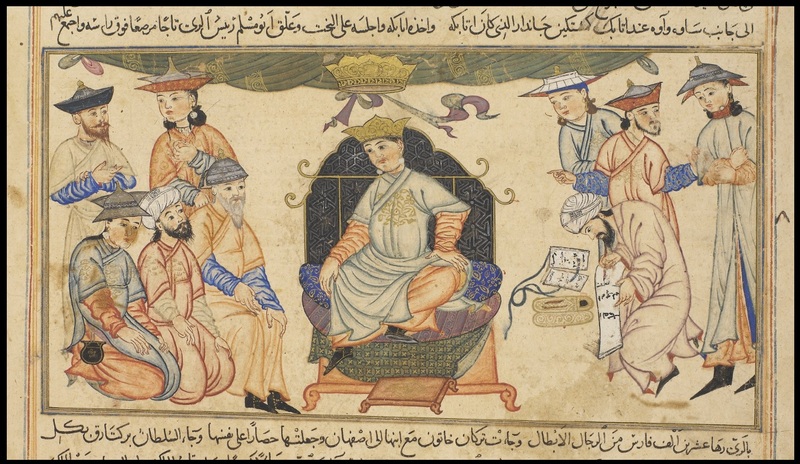 The author, Rashid al-Din, was a physician and court historian to the Ilkhanid court. Born about 1247 AD into a Jewish family, he converted to Islam and served as vizier (prime minister) to the sultan. He met an unhappy end in 1318 AD, being executed on a charge of poisoning his royal master. Before that, however, he wrote what would become one of the world’s most important historical and artistic documents. 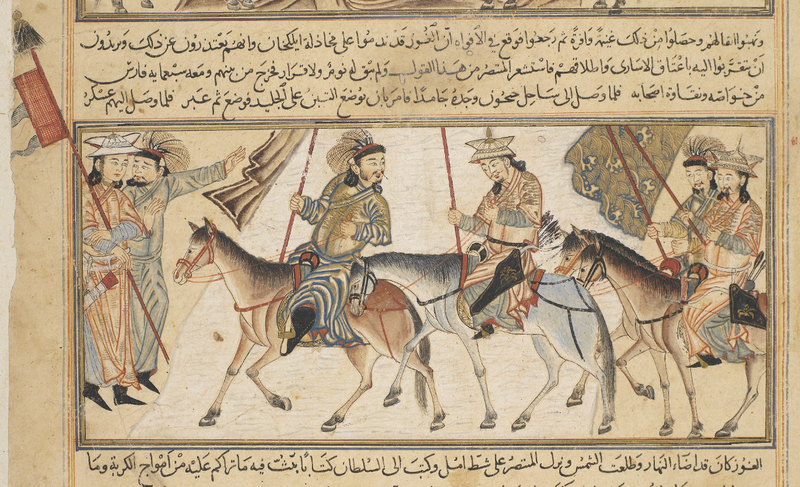 The Arabic copy of his Jami’ al-Tawarikh in the exhibition is a history of the world as it was then known, covering not only the history of the Mongols, but also that of the Chinese, Franks and Indians. Situated in the highly international and multi-cultural city of Tabriz in modern-day Iran, the scriptorium of Rashid al-Din welcomed artists from all parts of the Mongol empire and beyond. Elements of Byzantine, Chinese and other Islamic traditions are all evident in the illustrations. The Jami’ al-Tawarikh manuscript demonstrates a profound fusion of techniques, and marks the birth of a new and distinguished style within Persian painting. The Edinburgh portion of the manuscript made a long journey, from early fourteenth-century Iran to Victorian Scotland. The original manuscript left Iran and eventually passed to the court of the Mughals in India. It was divided into two parts around the mid-1700s, but both sections remained in India until the nineteenth century, when they were acquired by the British. The Edinburgh portion was acquired by Colonel John Baillie(1772–1833) of the East India Company, and together with other Islamic manuscripts, it was passed to Edinburgh University Library in 1876. The other portion was bequeathed to the Royal Asiatic Society and is now in private ownership. The manuscript on display is one of the greatest treasures of Edinburgh University Library. This exhibition offers a unique chance to view folios of the original manuscript, complemented by loans relating to the material culture of fourteenth-century Iran from the National Museum of Scotland. The exhibition is free and open to the public from 2 August 2014, Monday to Saturday, 10am to 5pm. With kind thanks to Andy Grout (Friends of Edinburgh University Library) for contributions, and the University of Edinburgh Digital Imaging Unit.